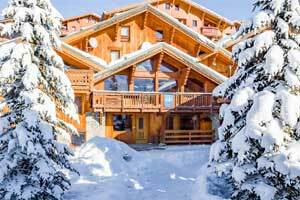 When booking a ski holiday, we can get caught up in the details – will there be a log fire? Which skis should I reserve? We can forget the most important question of all – will there be snow? 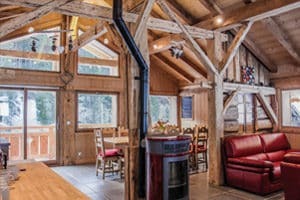 All of Family Ski Company’s chalets are situated in resorts that have independently been awarded four or five stars out of five for snow-sure, (snow-forecast.com). We have selected only three resorts we know are as close to perfect as possible for family skiing and snow reliability. In over 15 years none of our resorts has been closed early from lack of snow or otherwise. For peace of mind check and compare the stats with the Ski Club of Great Britain’s excellent snow depth comparator. 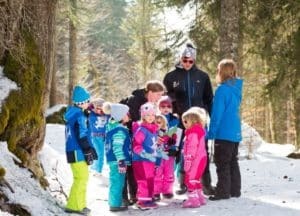 Though we have done the worrying for you in case of Family Ski resorts, here is what to look for when choosing any resort. It is a misconception that high altitude carries the only guarantee of good snow. Our resort of Ardent, sitting at 1260m gets a 5/5 snowsure rating ( snow–forecast.com ) whereas many much higher resorts score lower. This can be explained by how well the pistes are protected from the elements – wind and sunshine can both adversely affect the snow covering of a piste. In this case, it is important to look for pistes that link your village which are protected by either cliff bands or tree runs. Confirm with your tour operator whether these return pistes have granite or a grass base layer. The granite acts like a cold plate and so retains the snow far longer than grass – this is why some forward thinking resorts coat susceptible south facing pistes with granite chips. Avoid resorts that have grassy return slopes that are open to sunshine all day around, when a patch appears on such a slope, it very quickly degrades into a miserable muddy experience. Situate yourself within one or two lifts of extensive skiing at high altitude. 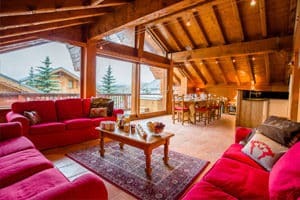 All of Family Ski Company’s chalets are situated within one or two lifts of skiing at 2000m in central positions. That’s a guarantee that does not involve a minibus! With the home run protected from the sun by a band of cliffs, this link to the village is as fail-safe as it gets, despite being at only 1260m, especially with its belt and braces snow cannon, and there is often still snow well after mid May and later. Proximity to Lake Geneva is one reason cited for relatively high annual snowfalls snow depth comparator. It is hardly surprising that people are prepared to drive to Ardent, after all, Snow-forecast.com gave Montriond/Ardent a solid five out of five for ‘snowsure’ and state it is ‘snowsure even in the poorest seasons’. 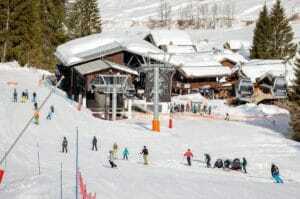 (Montriond is the commune down the valley which gives its name to the skiing area reached by the Ardent Bubble.) Lucky Family Ski Company guests just need to step out of their chalet door to benefit from this guarantee! 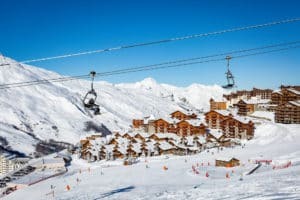 Les Coches 1460 m – Les Coches has been superbly arranged: chalets sit in the sun, but the return pistes sit in the trees! 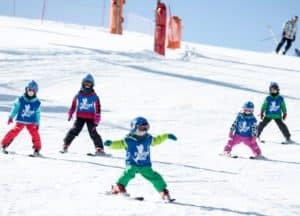 The Ski club of Great Britain emphasizes the importance of this – ‘Les Coches shares the same sheltered pistes (as La Plagne) which are well covered by snow-making cannons’ (Ski Club of Great Britain). 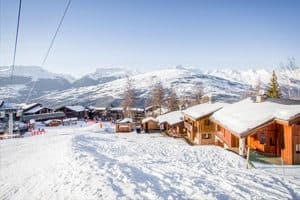 The return piste that goes right past Family Ski chalets is particularly well covered by snow cannon and is groomed as a top priority return route. The Three Valleys has some of the highest and most snow sure skiing in the Alps but the trick is to position yourself to take advantage of it. Skiing up to 3200m Reberty is at the right end of the 3 valleys to find yourself when snow is low! Reberty is at 2000m and one lift takes you to 2850m from where you can ski down to Val Thorens at 2300m and then access the highest skiing in the three valleys at 3200m. Click here to read the resort review by Ski Club of Great Britain.